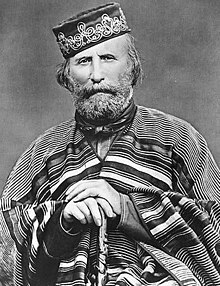 Giuseppe Garibaldi (4 July 1807 – 2 June 1882) was an Italian general, politician and nationalist who played a large role in the history of Italy. Qui si fa l'Italia o si muore. Here we either make Italy, or we die. To his lieutenant Nino Bixio at the Battle of Calatafimi, 15 May 1860. Quoted in Giuseppe Cesare Abba, Storia dei Mille, ch. Dopo la vittoria. Announcement of the expedition to conquer Rome, Palermo Cathedral, 1862. Quoted in Denis Mack Smith, Garibaldi, Arnoldo Mondadori Editore, 1993, p. 152. Il giorno in cui i contadini saranno educati nel vero, i tiranni e gli schiavi saranno impossibili sulla terra. The day the peasants will be educated in the truth, tyrants and slaves will be impossible on earth. Alla Società del Tiro in Ganzo, Caprera, 29 August 1864, in Scritti politici e militari, ricordi e pensieri inediti, p. 356. Bezzecca, 9 August 1866. Telegraphic answer to the message by general Alfonso La Marmora who ordered the retreat of the troops from Tyrol (see the image of the telegram). This page was last edited on 12 April 2018, at 19:44.